Slow Cooker Apple Butter. I had about 8 apples to use up in the fridge, so I decided to attempt some slow cooker apple butter. I was so glad I did. Not only was it super easy to make, but it let me use up all those bruised apples! I added a little bit of sweetener to my apples because I wanted to make sure this was very different than my slow cooker applesauce. I thought the small amount of sugar would help give it a thicker texture once cooked down. I really do think it helped, but next time I am going to try it with no sugar at all and see how it turns out. I know some of you are probably wondering if you can make this in the Instant Pot. I did find this recipe online if you want to try it. 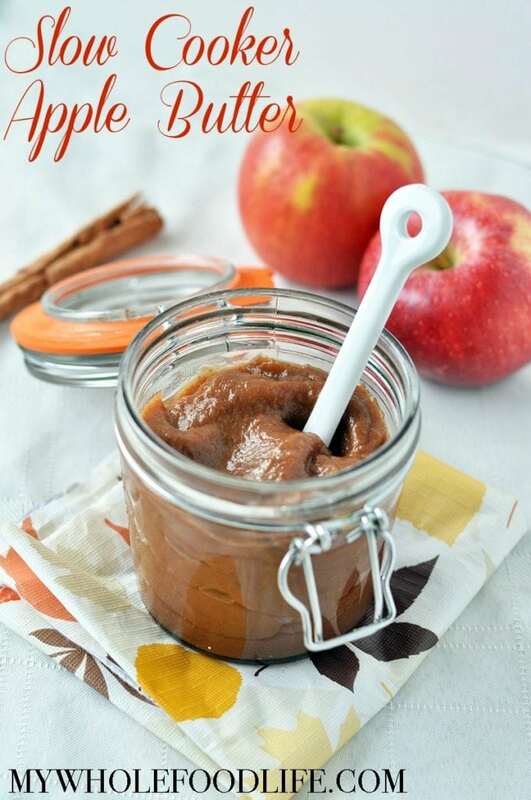 This wonderful apple butter will make your house smell amazing as it cooks! It’s perfect to use as a spread or even as a dip. The possibilities are endless. I plan on using this apple butter in an upcoming recipe too! Whip up the taste of Fall with this easy slow cooker apple butter! Place all the ingredients in a slow cooker . Cook on high for 3-4 hours or until apples look very soft. Once apples are cooked transfer to a blender and blend until smooth. It should keep in the fridge for a few weeks. Enjoy! You can definitely freeze it. I am not sure if any changes need to be made to can it. Maybe you can google to find out if you need to tweak the recipe for canning? Hi Melissa. Did you peel the apples? No I didn't, but you can if you like. This looks amazing!! Thank you for sharing, I will be making a batch of this the coming week. are the end results different when you use maple syrup vs coconut sugar? I was wondering because one is a liquid and the other is not. Also, Do you also have a recipe for slow cooker pumpkin butter? If not, I hope you will do a post on that soon! I don't have one for pumpkin butter, but I will now put that on my to do list! Sounds amazing! Pingback: Apple Butter | Are We Having Real Food Tonight?